Digital Housekeeping means cleaning up your social media profiles! At least once a year you should do a quick audit of your social media house and get things in order. It’s not unusual for social media companies to change privacy setting options or the layout of your profile. It’s also possible that your professional messaging has changed since you last updated your social media profiles. A future employer will look at your social media profiles and the information from your social media could sway their decision. CareerBuilder found that 44% of HR professionals were positively influenced by information found online about a candidate. The bad news is that 54% HR professionals were compelled not to hire a candidate based on what they discovered online. Even if you aren’t actively searching for a new job, having up-to-date profiles is a smart strategy for your overall career. I’ve broken down quick steps to take to clean up your LinkedIn, Facebook, Twitter and Instagram profiles. And always make sure you share the best information about yourself. Refresh this information on all your social media profiles. Especially the ones you are active on. If you are using the same headshot from years ago, update your profile picture with a current shot. Consider using the same photo across all your social media accounts for better personal brand recognition. Facebook, Twitter and LinkedIn allow you to select a banner image at the top of your profile. You can use this image to highlight an achievement, your interests or a special event. Your banner on Facebook may be different from LinkedIn. Remember, LinkedIn is a professional network. But employers are checking you out on Facebook too, so make sure your banner isn’t too personal or doesn’t reveal information you don’t want your future employer to know. Refresh your bio to keep it relevant. Make sure it includes the right keywords. And don’t forget to double-check the link you include to your personal website, online portfolio or LinkedIn profile to make sure it is still working. You don’t have to use the exact same wording across all your profiles, though you may want to. There should be enough similarities between the different profiles so anyone can tell they all belong to you. Remove unnecessary personal information from profiles. If you’ve included your mailing address, birth date, marital status or other personal information in any publically visible portion of your profile, it might be a good idea to delete it. If you are actively seeking new job opportunities, you may decide to make your contact information (email or phone number) viewable to the public to make it easy for recruiters to contact you. Check the social network’s privacy settings to make sure you aren’t unwittingly sharing it publicly. Keep in mind, your email or phone number may be required to set up your profile. LinkedIn allows you to list 50 skills in your “Skills & Endorsements” section. Add the skills you know are in-demand and employers are looking for. Use hard skills or industry knowledge and technical skills. Once you’ve listed them, you want endorsements so email colleagues who know your work and ask for a thumbs up. Better yet, endorse your colleagues’ skills on LinkedIn and perhaps they’ll return the favor! Facebook recently provided you with the option to download your Facebook data. Simply click on the down arrow at the top right of your Facebook screen and click on settings then click on “Download a copy of your Facebook data.” By reviewing the information Facebook has collected, you can better monitor what you shared. In other words, pay attention to any posts or pages you “like” or places you check-in. Want to make your Facebook profile stronger for job search? Quizzes are fun, but do they come at a price? You can never be sure how these apps might use your information. To see which apps and websites have access to your data, use the down arrow again and select settings. Choose the apps and websites menu item. This will show all the apps and websites you’ve given access to your Facebook profile. Remove apps you no longer trust or want to access your data. A pinned tweet is the first thing someone sees when they look at your profile. Why not select one of your tweets to be static. This is a great way to draw attention to an important achievement. The tweet you select could be a link to a recent blog post or it could highlight a positive professional milestone. If you do pin a tweet, be sure you update it fairly regularly. A pinned tweet from 2 years ago makes your profile look stale. To ensure you can easily see the news from key Twitter accounts, create lists to organize the feeds you want to follow and add accounts to the appropriate list. Your lists may be titled “industry news”, “local events”, “friends’, “target companies” and any other topics you don’t want to miss. When someone ends up on your Instagram profile, they will see thumbnails of your updates and you want to make sure your collection makes the best first impression. Review your posts and prune any that are irrelevant or a distraction from your personal brand. It’s ok to have a blend of personal posts and professional posts, but make sure you step back and assess the impression you are making. Find new, relevant hashtags directed to the tribe you want to associate with. You can go back and edit older posts to include the most beneficial hashtags. Using the right hashtags can help people find your updates (and profile). Show you are a savvy digital consumer by cleaning up your social media accounts. And remember, when you unwittingly share personal information online, it makes you vulnerable. 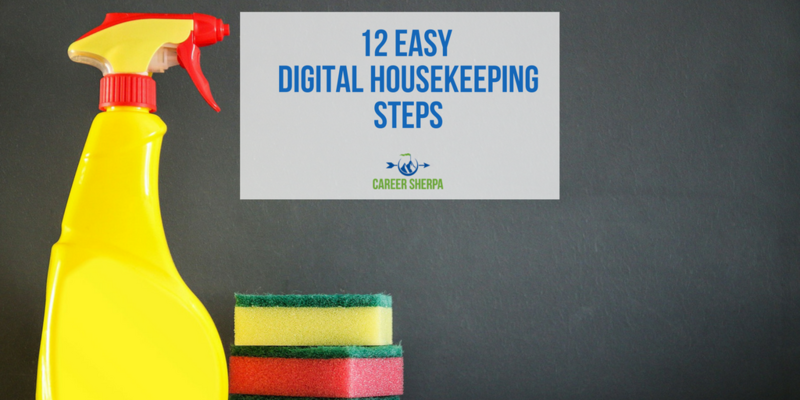 Get all 12 digital housekeeping steps in one easy infographic!